Perfectly crispy on the edges and chewy in the middle, these Crispy and Chewy Chocolate Chip Cookies are the go to favorite in our house and I know it will be in yours. I started baking cookies with mom when I was little. I loved to be in the kitchen stirring and baking and, of course, tasting. That’s the best part!! While we didn’t bake tons of cookies every year, there were some that we used to make all the time. Strangely enough, I don’t remember chocolate chip cookies being one of them. Ha! 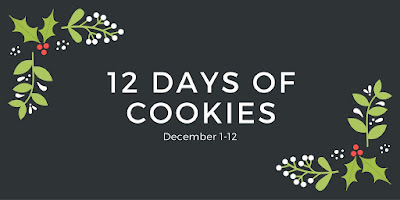 I’ll be sharing some of the family favorites for 12 Days of Cookies. You’re just going to have to stay tuned and see what they are. They’re not your typical holiday cookies. I will say that. Pre-teen AKHA used to make the recipe on the back of the chocolate chip bag. What’s that Friends episode? Phoebe called it Nestlay? Or something like that? It’s a tried and true recipe. It’s a recipe that every young baker should try and master before moving on to other variations or making their own. Now, my sister on the other hand. She couldn’t master that recipe. I remember her making chocolate chip cookies one year. The reason I remember is because it was so funny when they came out. There’s no telling what she did, but they were deemed chocolate chip crackers. My sister made chocolate chip crackers. Which isn’t necessary a bad thing. I mean, we ate them, so they tasted good. They were just…extra crispy? Maybe now they would be called chocolate chip cookie brittle. Who knows? I do know that my cookie baking life was forever changed when I watched the episode of Good Eats where Alton breaks down the anatomy of a chocolate chip cookie recipe. Heck. I didn’t know you could change things up and make them chewier and crispier or more flat or cake like by switching up some ingredients. Ever since then I’ve been working on my own recipe for the perfect chocolate chip cookie for us. I’ve made this version for years now. I didn’t want to share it because, well, it’s OUR recipe. It’s the first chocolate chip cookie I made with the hubs in mind back in that cold kitchen in Cleveland. The one where I had to ask him to turn the gas on and light the pilot light on the oven because I wanted to bake while he was at work. Yes, it was one of those apartments. These chocolate chips have delicious flavor. Please, please, PLEASE, I beg you to get some good chocolate chips. Don’t just go for the ones at eye level. There are so many other good chocolate chips out there. No disrespect to the yellow bag, but I’ve grown up since then and look for more complex chocolate flavors in my cookies. I hear Aldi has some excellent choices. Anyway, these chocolate chip cookies have the perfect balance of sweet and salt, vanilla and chocolate, crispy and chewy. They truly are the perfect cookie. They are the perfect cookie for us. These cookies have the perfect amount of chocolate chips, too. See what I mean? It’s the perfect ration of delicious dough to chip. You know you’re going to get a balanced bite every time. You most assuredly can’t go wrong when you make these cookies. There is a note in the recipe for less crispy cookies. I have baked them both ways. If you lower the oven to 350 and bake them just a little longer then they will be more chewy than crispy. At least that’s been my experience with this batter. And no, I don’t refrigerate it before I bake them. If you want taller cookies, then refrigerate before baking. But the addition of the shortening keeps them from spreading too much during baking. This makes them the perfect height when they come out of the oven. Like I said, the perfect chocolate chip cookie for us. How do you like your chocolate chip cookies? 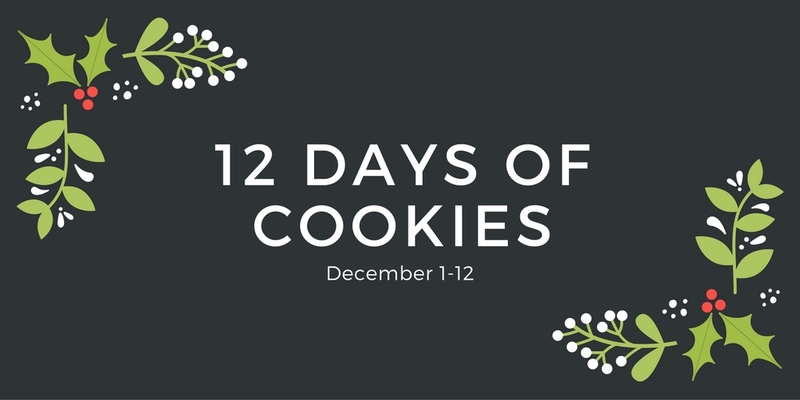 Make sure to see what the other bloggers are sharing for 12 Days of Cookies. Combine the flour with the salt and baking soda in a mixing bowl. Set aside. Using the whisk attachment, cream the butter and shortening with the sugars. Add the eggs one at a time stirring between each addition before stirring in the vanilla extract. Switch to the paddle attachment and add the flour mixture slowly to the sugar mixture until combined. On low speed, stir in the chocolate chips. Drop by tablespoons into a baking sheet lined with silpat or greased parchment paper. Bake* at 375 for 8 to 10 minutes or until lightly browned on the edges. Remove from the oven and cool 5 minutes in the pan before moving to a wire rack to cool completely. *For less crisp cookies, bake at 350 for 12 to 15 minutes. I love the sound of these and they look fabulous! Definitely a “must bake”! Thank you! They are a great, solid recipe to whip up any time. Thank you! It was hilarious. We tease her about to this day and it’s been DECADES! Everybody’s favorite cookie. Great choice for your first share this event. Thank you! They are a favorite in our house. I love the tips you share about taller cookies and more. 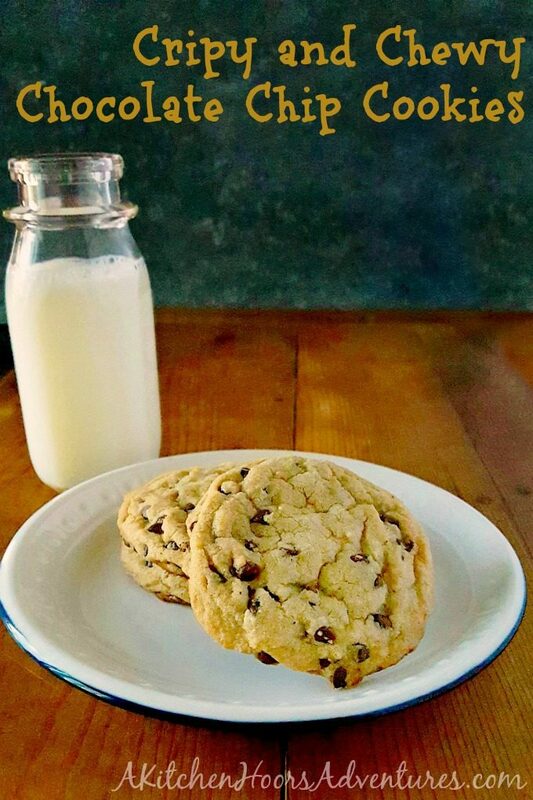 Chocolate Chip cookies are a classic and are loved by everyone! Thank you! I love how just be altering the ingredients slightly you can get a completely different cookie. Science is awesome. Can’t beat a good chocolate chip cookie, and I agree you need good chocolate chips! YES! The chips make the cookie. Thank you!